FRCS (Orth) U.K., FRCS (Surg) U.K, Dip. Sports Medicine U.K.
MS (Orth) Bombay, D (Orth) Bombay. 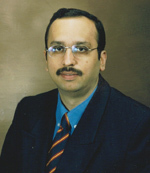 Dr Malhan completed his MS in orthopaedics in one of Asia’s premier institutions - King Edward Memorial Hospital, Bombay. He quickly progressed to become a junior consultant and lecturer in orthopaedic surgery at the same institute. His interest in joint replacement and sports surgery took him overseas where he spent nearly 7 years training in some of the best centers for joint replacement and resurfacing surgery including the Robert Jones and Agnes Hunt Hospital, Oswestry, U.K.
Dr. Malhan completed the British orthopaedic training programme in the Oswestry-Stoke rotation (West Midlands) and was awarded the FRCS(Orth). Besides extensive training in primary and revision joint replacement surgery he has also worked in the National institute of sports surgery – UK and units dedicated to knee and shoulder arthroscopic surgery. He is well versed with advanced techniques in cartilage and ligament reconstruction. Dr Malhan did his post FRCS (Orth) fellowship in advanced joint surgery at the Freeman hospital, Newcastle - UK. He is presently a consultant surgeon at the Wockhardt Bone and Joint hospital, Bombay (now called Mumbai) and specializes in knee, hip and shoulder surgery. Here he has established the Regional Hip Resurfacing and Joint Replacement Center for western India. This center has state of the art infrastructure and attracts patients from all over India and overseas.